Mr. 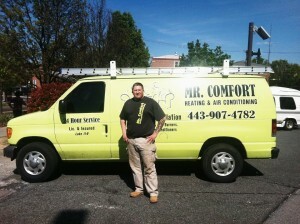 Comfort offers heating and cooling services, both residential and commercial and has developed a strong reputation for excellent and courteous service. The company started by Dennis Mellott has created a stellar reputation for Mr. Comfort Services. We’ve built our business one customer at a time and offer prompt, professional and highly skilled HVAC services for all your commercial and residential needs. We provide the following services: heating installation, repair and maintenance plans for gas, electric or oil furnaces, heat pumps, air conditioning installation and repair, hot water heater repair and installation, and state of the art equipment. We pride ourselves on giving our customers the best service at a reasonable price with courteous and knowledgeable technicians that arrive on time with the proper equipment to get the job done right the first time. Our 100% Satisfaction guarantee will provide you with peace of mind. Our focus on quality and excellent customer service is what has allowed us to succeed. We can take care of all of your residential or commercial heating or cooling repair, installation and maintenance needs.